From the sixth to late eleventh centuries, the warship par excellence in the Mediterranean was the dromon and its Muslim and Latin imitations, although Byzantines also developed the chelandion, originally an oared horse transport, which was also imitated. By the tenth century dromons had become biremes with two banks of 50 oars, one below and one above deck. A standard ship’s complement (Gr. ousia) consisted of 108 men, excluding officers, marines, and specialists such as helmsmen and a carpenter. Around 31.5 meters (103 ft.) long, they carried two masts with lateen sails and had quarter rudders on both stern quarters. They also had fighting castles on each side just aft of the foremast and a foredeck at the prow, below which was housed their siphon for hurling Greek fire: this was a weapon that used a force pump to eject a stream of petroleum naphtha fuel that was set alight, creating a tongue of flame that could destroy enemy ships. Monoreme dromons with only 50 oars were known as galeai, and it seems certain that the Latin galea developed from them. The earliest uses of the Latin term were by a group of eleventh-century Italo-Norman chroniclers, which suggests an adaptation of this ship type in southern Italy from Byzantine originals encountered there. Even though references to galee proliferated rapidly, however, they were never described in detail and all that is known about early galee is that they had fine lines and were fast. The earliest documents with construction details are from the Angevin kingdom of Sicily between 1269 and 1284. Almost certainly, the oarage system was reconfigured so that two oarsmen could row from one bench position above deck. This made immeasurable difference to the oar mechanics, increasing oarsmen’s combined power delivery markedly. No longer did one bank row below deck in stygian darkness and foul air. It also freed holds for supplies, water, spare gear, and armaments. No wonder that the galea spread rapidly in the West and came to be emulated in both the Byzantine and Muslim worlds. The earliest datable illustrations of galee are three miniatures in the Madrid manuscript of the Synopsis historiarum of John Skylitzes, produced in Palermo around 1160 (MS Madrid, Biblioteca Nacional, vitr. 26–2). These clearly show bireme galleys with a different oarage system. One file of oars was rowed through oarports, but the other was worked above the gunwale. The same system is depicted even more clearly in an early thirteenth-century manuscript of the Carmen ad honorem Augusti of Peter of Eboli (MS Bern, Burgerbibliothek, 120). This bireme oarage system became known as the alla sensile system. Two oarsmen each rowed single oars from the same bench above deck. Using a stand-and-sit stroke as opposed to the fully seated stroke of classical and Byzantine galleys, they threw their whole weight and the power of their legs into the stroke by falling back onto the bench. The inboard oar was pulled through an oarport in the outrigger, while the outboard oar was pulled against a thole, a pin set in the gunwale (Gr. apostis, It. posticcio, apposticio), to which an oar was held by an oar thong or grommet. 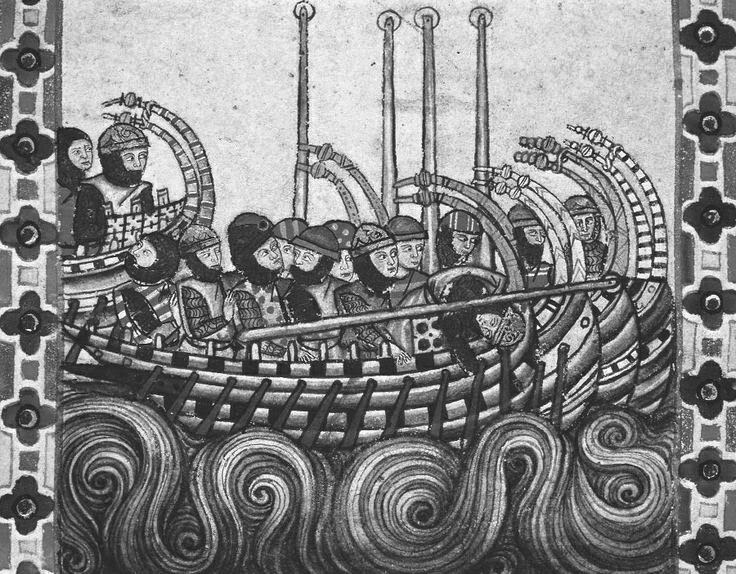 Such bireme galleys remained the norm throughout the main age of the crusades. There is no clear evidence for galleys using any other type of oarage system, and occasional literary references to triremes or to more than one oarsmen pulling each oar are either classical allusions or mistakes. Only in the early fourteenth century did Marino Sanudo Torsello report that: “in [ . . .] 1290, two oarsmen used to row on a bench on almost all galleys which sailed the sea. Later more perceptive men realized that three oarsmen could row on each of the aforesaid benches. Almost everyone uses this nowadays” [Marino Sanudo Torsello, “Liber Secretorum Fidelium Crucis,” in Gesta Dei per Francos, ed. Jacques Bongars, 2 vols. (Hannover: Typis Wechelianis, 1611), p. 57]. Standard bireme galee came to measure around 39.5 meters (1291/2 ft.) in overall length; they were longer than dromons because they mounted 108 rather than 100 oars and because the stand-and-sit stroke needed a distance between any two tholes (Lat. interscalmium) of around 1.20 meters (4 ft.) rather than the 1 meter (31/4 ft.) for fully-seated oarsmen. Their beam was around 4.6 meters (15 ft.) at the deck amidships, and their depth in hold around 2 meters (61/2 ft.). They still carried only two masts with lateen sails, the foremasts being almost 16 meters (521/2 ft.) long with yards nearly 27 meters (881/2 ft.) and the midships masts being 11 meters (36 ft.) long with yards of 20.5 meters (671/4 ft.). The stern-quarter rudders were 6 meters (193/4 ft.) long. By the later thirteenth century, standard crews on Angevin galleys consisted of 108 oarsmen, 2 masters, 4 helmsmen, 36 marines, and 2 ship’s boys. Standard armaments included around 30 crossbows, 8 cases of quarrels (crossbow bolts), 40 shields, 200 lances, 10 halberds, 47 axes, 400 darts, 108 helmets and padded jackets for the oarsmen, 40 glass bottles for Greek fire and 100 pots of powdered quick lime, 2 iron grapnels, rigging cutters, and possibly iron rockets for shooting Greek fire. Although no substantiatable evidence suggests that any oarage system other than the alla sensile system was used until the late thirteenth century, a variety of names for galleys other than galee appeared sporadically in the sources: sagene, sagittae, gatti, and garabi in particular. The term sagena appeared first for vessels of Muslim and Croatian corsairs in Byzantine sources. The type was developed among the Slavs on the east coast of the Adriatic Sea. Sagitta (lit. “arrow”) was also applied to corsair galleys, but to those of the Latin West. They were smaller than galee and presumably very fast, to judge by their name. Thirteenth-century Genoese documents refer to sagittae with 48, 58, 64, and 80 oars. Gattus was derived from the Arabic qiț‘a and appeared mainly in late eleventh- and twelfth-century sources, referring to galleys larger than the norm. The ships were sometimes described as triremes, although that may have been a classicizing literary affectation. Garabus was again derived from Arabic: ghurāb, or possibly also qārib, since it is unclear whether these terms were not simply variants of the same name. ‘Aghriba were sometimes said to have carried 140 oars, and garabus may also have been applied to galleys larger than the norm. If they really did row 140 oars, then they must have been triremes. Byzantines had oared horse transports equipped with landing ramps as early as the ninth century and retained that capability into the twelfth. The chronicler William of Tyre reports Byzantine horse transports supplied for a combined Byzantine-Frankish attack on Egypt in 1169 as “also having accessible ports at the poops for embarking and disembarking them [horses], also with bridges by which ease of entrance and exit both of men and of horses might be attended to as usual” [William of Tyre, Chronicon, ed. Robert B. C. Huygens (Turnhout: Brepols, 1986), p. 927]. Muslims too were transporting horses on specialized ‘ushāriyyāt and tarā‘id by the tenth century. Twelfth-century tarā‘id could hold forty horses. The Venetians were apparently the first Latins to transport horses to Outremer in 1123, but it is unknown what types of ship they used. By this time the Normans of Sicily definitely could transport horses by galley, because during the Mahdia campaign (1087) 500 cavalry disembarked from beached ships to attack Muslim troops; only galleys could be beached. Horses were transported in both sailing ships and galleys from the West to Outremer from 1129 up to the time of the Third Crusade. Venice used oared horse transports with stern-quarter ports and landing bridges for the Fourth Crusade (1202–1204), and both appeared among the miscellaneous fleets that reached Damietta during the Fifth Crusade (1217–1221). In 1224 Emperor Frederick II prepared a great fleet of 50 oared horse transports, each carrying forty horses, and in 1246 agents of King Louis IX of France contracted with Genoa for 12 taride to carry twenty horses each for his Crusade to the East. The Byzantine term for an oared horse transport was chelandion while those of the Muslims had been ‘ushari and tarrīda. In the West uscerius and variants became the generic term for an oared horse transport, while chelandion became adopted as chelandre and variants and tarrīda as taride/tarida. Whether there was ever any real difference between Western chelandre and taride is debatable, but as the thirteenth century wore on, tarida became more common and chelandre disappeared. Louis IX’s contract of 1246 has the earliest specifications, and these may be compared to those of thirty-horse taride constructed for Charles I of Anjou between 1274 and 1281. The twelfth and thirteenth centuries saw no innovation in the technology or construction of Mediterranean sailing naves; however, the length and beam, number of masts, and number of decks and depth in hold of some increased dramatically. By the mid–twelfth century, iconography depicted as a matter of course two-masted naves with multiple-tiered sterncastles and substantial forecastles, such as the Genoese ship conveying Conrad of Montferrat to the Holy Land in the Paris manuscript of the Annals of Genoa [MS Paris, Bibliothèque nationale de France, suppl.lat.773]. By the thirteenth century, the mosaics of San Marco in Venice also showed three-masted ships. No documentary evidence for three-masted ships survives; however, it is available for two-masted ships provided by Genoa and Venice in 1246–1269 for the two crusades of Louis IX of France. With the amount of deck space legislated by Marseilles for each pilgrim or crusader, ships of the size of the average three-decked ship could carry around 500–550 passengers. 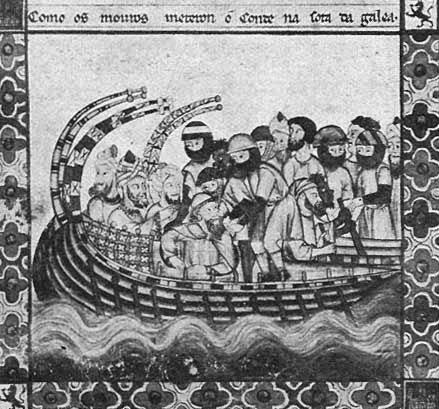 One thirteenth century Genoese ship, the Oliva, is known to have had a capacity of 1,100 passengers. Such ships were intercepted and captured by Saladin’s squadrons in the 1170s and 1180s and were referred to in Arabic sources as buțash. According to Arabic sources, one bațsha wrecked off Damietta in 1181/1182 was carrying 2,500 passengers, of whom 1,690 were taken alive. The figures are probably exaggerated, but perhaps not by a great deal if the ship was indeed very large. They could also carry up to 100 horses, normally on the lowest deck, as revealed by a Marseillese contract of 1268 with Louis IX, which specified a fare of 25 shillings for passengers if horses were not stabled there. As the French chronicler Joinville remarked: “On the day that we entered into our ships, the port of the ship was opened and all the horses we wanted to take to Outremer were put inside, and then the port was closed again and plugged well, as when a cask is caulked, because, when the ship is on the high sea, the whole port is under water” [John of Joinville, Vie de Saint Louis, ed. J. Monfrin (Paris: Classsiques Garnier, 1998), p. 62]. Another Northern ship, the cog (MLG kogge), appeared in crusader fleets as early as the Second Crusade (1147–1149). Originally cogs had been flat-bottomed estuarine and river craft in Frisia, but in the early twelfth century cogs appeared that had flat floors and high sides, a radical new rudder hung off a straight sternpost, and straight stemposts, and that could hold the high seas. The wreck from Kolding Fjord (Denmark), dated to the late twelfth or thirteenth centuries, was around 18.3 meters (60 ft.) long and 6.1 (13/4 ft.) meters wide, with a mast step around 1.98 meters (61/2 ft.) forward of midships. It had a flat bottom with edge-joined strakes and sides with clinker strakes. Traces of rust on the sternpost revealed a sternpost rudder rather than the Norse quarter rudder. One of the earliest depictions of such a cog is on the first seal of the city of Elbing (mod. Elbląg, Poland) in Prussia (1242). Whether they evolved from earlier Frisian cogs or whether this name was taken over by a completely new ocean-going craft is debatable. Cogs of the new type appeared in northern fleets for the Third and Fifth Crusades. In 1217 Count William I of Holland left with a fleet of cogs to join the Fifth Crusade at Damietta. Ports were cut into their sterns to embark the horses, and when the horses were on board, the ports were covered and sealed with pitch and tar. The Mediterranean technology for embarking and disembarking horses by ramps through ports in the hull became adopted in northern Europe. Maritime history was an evolutionary process. The bireme galee, one-decked and single-masted Mediterranean naves, and Norse knerrir and snekkjur of the age of the First Crusade were replaced 200 years later by trireme galee, multiple-decked and masted naves, and northern cogs. Bibliography The Age of the Galley: Mediterranean Oared Vessels since Pre- Classical Times, ed. John Morrison (London: Conway Maritime Press, 1995). Cogs, Caravels and Galleons: The Sailing Ship, 1000–1650, ed. Richard W. Unger (London: Conway Maritime Press, 1994). Crumlin-Pedersen, Ole, “The Skuldelev Ships,” Acta Archaeologica 38 (1967), 73–174. A History of Seafaring Based on Underwater Archaeology, ed. George F. Bass (London: Thames and Hudson, 1972). Pryor, John H., “The Transportation of Horses by Sea during the Era of the Crusades: Eighth Century to 1285 A.D.,” Mariner’s Mirror 68 (1982), 9–27, 103–125. ———, “The Naval Architecture of Crusader Transport Ships: A Reconstruction of Some Archetypes for Round- Hulled Sailing Ships,” Mariner’s Mirror 70 (1984), 171–219, 275–292, 363–386. ———, Geography, Technology, and War: Studies in the Maritime History of the Mediterranean, 649–1571 (Cambridge: Cambridge University Press, 1988). ———, “The Naval Architecture of Crusader Transport Ships and Horse Transports Revisited,” Mariner’s Mirror 76 (1990), 255–273. ———, “The Galleys of Charles I of Anjou, King of Sicily: ca. 1269–84,” Studies in Medieval and Renaissance History 14 (1993), 33–103. Serçe Limaný: An Eleventh-Century Shipwreck, vol. 1: The Ship and Its Anchorage, Crew, and Passengers, ed. George F. Bass et al. (College Station: Texas A&M University Press, 2004). Steffy, John R., Wooden Ship Building and the Interpretation of Shipwrecks (College Station: Texas A&M University Press, 1994). Unger, Richard W., The Ship in the Medieval Economy, 600–1600 (London: Croom Hill, 1980). ———, “Warships and Cargo Ships in Medieval Europe,” Technology and Culture 22 (1981), 233–252. Yassý Ada, vol. 1: A Seventh-Century Byzantine Shipwreck, ed. George F. Bass and Frederick H. van Doorninck, Jr. (College Station: Texas A&M University Press, 1982).